This textbook introduces the reader to the basic concepts and equations that describe stellar structure. Various approximation techniques are used to solve equations, and an intuitive rather than rigorous approach is employed to interpret the properties of the stars. The book provides step-by-step instructions, helpful exercises and relevant historical lessons to familiarize students with key concepts and mathematical theories. Based upon a series of one-semester (12 weeks) elective undergraduate courses offered at the University of Regina, this book is intended for students who are interested in seeing how basic calculus and introductory physics can be applied to the understanding of the stars from their formation to their death. 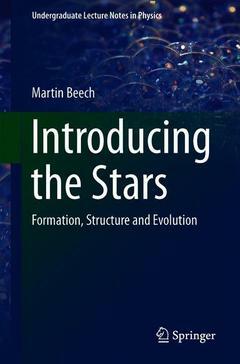 The text provides an intermediate stepping stone between lower-level undergraduate classes and more specialized postgraduate texts on the subject of stellar structure. Martin Beech is a Professor and Department Head of Astronomy at Campion College, The University of Regina, Canada. He has an MSc from Sussex, UK, and earned his PhD at Western Ontario. He has written several books for Springer, including The Pillars of Creation:Giant Molecular Clouds, Star Formation, and Cosmic Recycling (2017) and Alpha Centauri: Unveiling the Secrets of Our Nearest Stellar Neighbor (2015).